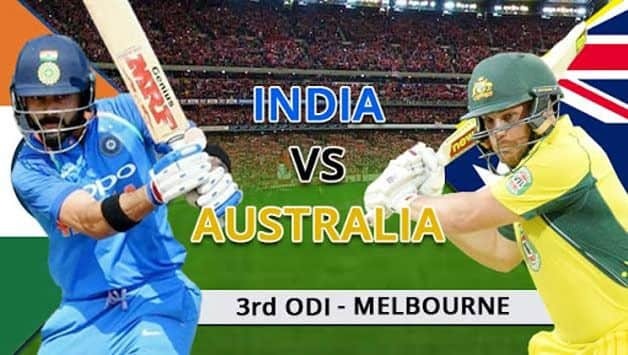 India vs Australia 2018-19, 3rd ODI: LIVE cricket score of India vs Australia at the Melbourne Cricket Ground, Melbourne, News, latest updates, live streaming, coverage and highlights. Will India complete a double or will Australia have the last laugh? INDIA WIN: And that’s the game. Kedar Jadhav finishes off in style – a boundary – as India register a seven-wicket win against Australia at the MCG. India win the series 2-1, their first bilateral win Down Under and complete a delightful double. What a historic tour it’s been for Virat Kohli and his team. New Zealand, take notice. A firm challenge awaits in a few days. FOUR: Jadhav, you beauty; hits Siddle over the top for a FOUR to bring the equation down to 9 off 10. DROPPED: Australia continue to be sloppy in the field. 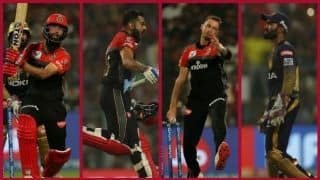 Dhoni dropped a second time – this time by Aaron Finch. Tough but you’ve got to take that in international cricket. And what more? Kedar Jadhav survives a clse run out chance. Coming back for the second, Jadhav puts in the dive and is in by an inch and a frame. The next ball goes for a boundary and takes Dhoni to 81. India need 20 off 15. Jadhav presents serious case: Excellent running between Jadhav and Dhoni as they continue to bring India closer to victory. A thumping boundary from Jadhav has reduced the equation to 35 off 27. While we have been praising Dhoni for his efforts, spare a thought about Kedar Jadhav. The man hasn’t played international cricket since November and comes in at a stage where a series is on the line. 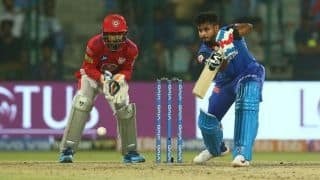 A replacement for Ambati Rayudu, Jadhav has impressed with a composed knock alongside Dhoni. If India win this, he deserves credit no less than Dhoni or Chahal. Final 50 runs needed off 34 balls. The equation seems easy but the ball difference of 17 runs still gives Australia hope. Zampa has finished his quota of 10 overs. Dhoni and Jadhav have added 72 off 88 and India need them both to see them over the line. Dhoni survives again: An LBW shout against him but the ball seems to be high. Australia take a review, unsurprisingly, and the ball tracking agrees with the call. Raps Dhoni on top of his pads and the replay suggests that it would miss the stumps. India 172 for 3, need another 59 off 48. A fine 50-run partnership comes up between Dhoni and Jadhav. With boundaries not easy to come by, both have run amazingly well between the wickets. India 165 for 3, need 66 off 61. FIFTY for Dhoni: And for the third time this series, MS Dhoni has a half-century. What a fine comeback it has been for the former Indian captain. But can he win India the game remains the question everyone must be thinking of. India 150/3, require another 81 off 72 balls. Interesting period of play. India are 141 for 3 (need another 90 off 84) but there is a certain flow missing in their chase. However, Kedar Jadhav and MS Dhoni are able to rotate strike, despite the odd tidy over by Australia. Adam Zampa has been too good, giving away just 27 runs from 8 overs. He hasn’t picked a wicket yet but the way he has contained the Indian batsmen makes you wonder whether Australia committed an error by leaving him out of the first two games. 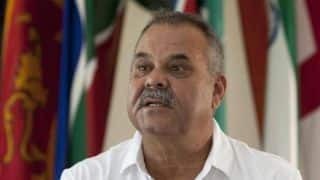 “I will not forget taking Kohli’s wicket in a long time,” said Jhye Richardson after the first ODI. Since, he’s dismissed the Indian captain twice more. WICKET: Big wicket for Australia. Virat Kohli edges Jhye Richardson to Alex Carey and goes for 46. It’s the third time in the series that Richardson has dismissed the Indian captain. India 113 for 3 as Kohli expresses disappointment on his way back. India still over a 100 runs away, and this wicket would surely lift Australia. 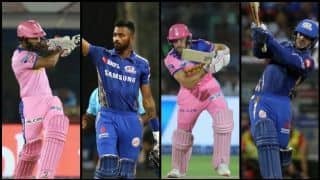 Kedar Jadhav has not batted for India in a while, and then there’s Dinesh Karthik, Ravindra Jadeja and the debutant Vijay Shankar. There is batting left for India but you never know what the pressure of chasing in a decider can do. Dhoni and Kohli shepherding India’s chase: The current and former India captain are building yet another partnership having added 54 runs for the third wicket and bringing up the 100 for India. Contrary to the usual, the running between the wickets by the two players has been a little erratic. There were a couple of poor calls between the two that saw both batsmen almost getting run-out. Australia need to take these half-chances if they are to defend 230. 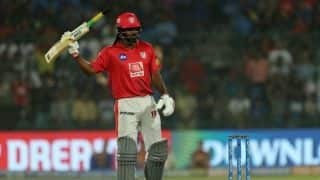 Remember, India bat deep. End of Over 20: India move to 73 for 2. Australia have done well to remove both Indian openers but they will be aware that it’s a modest total they are defending. Kohli and Dhoni are key for India, and somehow if Australia get get Kohli, they will sense a chance. India’s middle order hasn’t really fired and the home team would fancy their chances against them. But before that, they have Kohli to conquer. DROPPED: What! Glenn Maxwell puts down MS Dhoni first ball. Short ball and the former India captain cuts it straight to point. Maxwell, who would take it nine out of 10 times, puts down an easy chance. 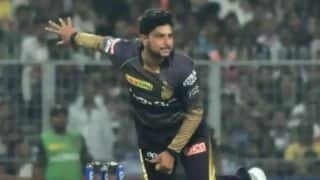 Stoinis has his hands on head. Australia can’t believe it. Dhoni lives. WICKET: Shikhar Dhawan is furious with himself as India lose their second wicket. Full delivery and Dhawan drives it uppishly straight back to Marcus Stoinis who takes a wonderful catch in his follow-up. India 59 for 2, need 172 more to win. After that dropped chance, two boundaries in an over from Kohli brings up India’s 50. They are 51 for 1, need 180 more to win. DROPPED: Australia put down Kohli. Touch chance for Handscomb at slips but that’s what you get when you have a bowler as tall as Stanlake operating. It just takes off, gets the edge of Kohli’s bat and even though Handscomb gets his hand to it, the ball races towards the fence. That was bowled at over 141 km/hour. India 39 for 1 after 12 overs. India 26 for 1 after 10 overs. Kohli 5 off 12 and Dhawan is 12 of 31. WICKET: First wicket goes down, and it’s Rohit Sharma, who edges Peter Siddle to slip. Full ball, and Rohit, going for the flick, somehow managed to edge the ball behind as Shaun Marsh takes a diving catch at first slip. India 16 for 1 in 7 overs. First boundary of the innings: Siddle drifts the ball down Rohit’s legs and the opener flicks it in the air for the first boundary of the innings. The heavy outfield threatened to stop the ball but the ball had just enough legs to go past the boundary ropes. India 15 without loss. End of Over 5: India 10/0. Rohit Sharma and Shikhar Dhawan are happy to bide their time. And rightly so. 231 is not a huge total and as we’ve seen in the past, everytime these two get India off to a good total, it figuratively lands India the match. End of Over 2: India 1-0, a cautious start, Peter Siddle starts with a maiden. 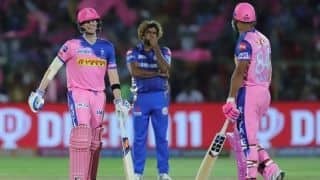 Close shout against Rohit Sharma, In fact, it looked so convincing that Finch took the review. But in the end, Australia will end up losing it as the ball was not hitting the stumps completely. The umpire’s decision stays and so does Rohit. And the covers are coming off, and the Indian openers have walked out. The chase set to get underway. So India need 231 runs to register their maiden bilateral series win in Australia and complete a delightful double. Bhuvneshwar Kumar once again provided the perefect start removing Australia’s openers cheaply before Shaun Marsh and Usman Khawaja put the innings back on track with a 73-run stand. But that was all she wrote because once India introduced Yuzvendra Chahal, it all went downhill for the hosts. The legspinner removed both set batsmen – Marsh and Khawaja in the same over and Australia never recovered. Peter Handscomb gave Australia hope with a solid half-century but with wickets falling at the other end, getting Australia to 250 was a bridge too far to cross even for him. Eventually Australia were bowled out without lasting 50 overs. Can India get these runs? Join us shortly for the chase. Australia bowled out for 230: Shami cleans up Billy Stanlake for a DUCK to pick up his second wicket. Australia all out for 230 inside 50 overs. Sixth wicket for Chahal: And with that the legspinner has registered his career-best ODI figures, besting his 5 for 22 against South Africa last year. 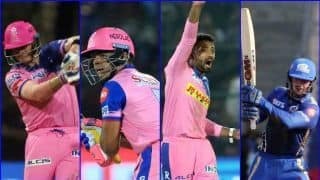 Tosses is up and Zampa holes out to Shikhar Dhawan in the deep. Australioa 228 for 9. WICKET: Playing his first match of the series, Yuzvendra Chahal picks up a five-wicket-haul. A quicker one and catches Peter Handscomb plumb on the backfoot, a review unable to save him. Terrific way to comeback into the team. Australia 8 down for 219. 250 looking tough now with Handscomb gone. WICKET: A fourth wicket for Yuzvendra Chahal has Australia 7 down for 206. Jhye Richardson plays a miscued flick to pick out Kedar Jadhav as short midwicket. With six overs and three wickets remaining, 250 seems a challenge for Australia. If they get there, it has to be because of Peter Handscomb. Adam Zampa is the new man in. HALF-CENTURY for Peter Handscomb off 57 balls. This has been an extremely crucial innings by him batting with the tail. Australia 197 for 6 with 8 overs to go. Australia approaching 200 and Handscomb his half-century. 193 for 6 in 41 overs. A run a ball from here would give them 250. How much do you back Australia to get at this point? India sense an opportunity and have rightly brought back Yuzvendra Chahal. End of Over 39: Australia reach 182 for 6. Jhye Richardson and Peter Handscomb have added 21 runs off 25 balls. Handscomb has once again played an assured innings of 39 off 45 and remains the key for Australia. Not much batting to come after this. Vijay Shankar has been brought back for his second spell. He’s conceded 15 off five overs. WICKET: Australia 161 for 6. First wicket for Mohammed Shami, but it’s that man again, Bhuvneshwar Kumar, who simply cannot be left out. Takes a stunning catch running in from fine leg to get rid of Glenn Maxwell, who was beginning to look dangerous. Short ball from Shami and Maxwell goes for the pull. He had earlier top edged him for a boundary but this one climbed on to him and Maxwell skied it. Bhuvneshwar, coming in from fine leg, puts in a dive forward and takes a stunning catch. This is a vital stand for Australia. Handscomb and Maxwell looking assured against Chahal. Maxwell takes the legspinner for another two-boundary over to inform India that Australia are still in int. 153 for 5 in 34 overs. With Australia trying to up the ante, Glenn Maxwell cuts loose with two quick boundaries. Australia 140/5 in the 33rd over. WICKET: Third one for Yuzvendra Chahal. He is on fire, sends back the dangerous Marcus Stoinis. Pitches just about right and turns just about enough to take the outside edge, and Rohit Sharma takes a catch moving forward. Australia have lost HALF their side for 123. Marcus Stoinis and Peter Handscomb are the two new batsmen coming together. They bailed Australia out of trouble in the first ODI and they team would require them to produce a repeat of it today. Australia 122/4 after 29 overs. WICKET: Two strikes from Yuzvendra Chahal in his first over. And it’s the two set batsmen whom he’s dismissed – Marsh and Khawaja. First, an excellent piece of work from Dhoni behind the stumps saw Marsh failing to get back inside the crease. Two balls later, Chahal foxes Khawaja with a relatively slower delivery as the batsmen lobs a simple catch back to the bowler. Australia rocked at 101 for 4. Australia once again following a similar pattern. After struggling in the first 10-15 overs, Shaun Marsh and Usman Khawaja have seem to be on track towards rebuilding the innings. Couple of boundaries from Marsh off Kedar Jadhav to bring up the 50-run partnership between him and Khawaja. Australia 8-0 for 2 after 20 overs. FIRST boundary of the innings in almost 10 overs. Australia reach 55/2 in 17 overs. DROPPED: Rare miss from MS Dhoni behind the stumps as fails to hang on to an edge of Shaun Marsh off the bowling of Kedar Jadhav. End of Over 15: And Australia are content playing the waiting game. They are scoring at 3 runs an over to reach 45/1. 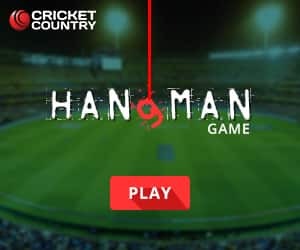 India have strangled them. It’s been over 50 balls since the last boundary. Vijay Shankar, the debutant, has been handed the ball. 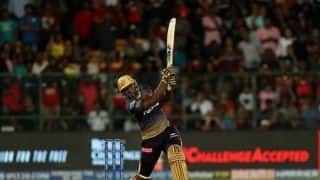 Kedar Jadhav operating from the other end. It’s been 34 balls since Australia scored a boundary. WICKET: And he’s plumb. Aaron Finch’s wretched run continues as for the third time in the series, the Australia captain falls to Bhuvneshwar Kumar. Finch comes forward but the balls beats the bat and thuds onto his pads. Up goes the finger and Bhuvneshwar stamps his authority over Finch yet again. He goes for 14 and Australia are 27 for 1. Australia 25/1 after 7 overs. Finch looking extremely uncomfortable although he did get 8 off that over. He and Khawaja ran 4 at the huge MCG before a ball flew past Rohit Sharma at first slip off the edge of Finch’s bat. He moves to 14 off 18. Australia 15/1 after 6 overs. India have already bowled 30 DOT BALLS to them. Boundary: Short & wide, and Usman Khawaja crunches it away for a FOUR to get off the mark on the 9th ball. Australia need more of these. Five overs gone and India have been tidy, giving away just 11 runs. They’ve got an early wicket, and have made life tough for Aaron Finch on this slightly slowish wicket. New man in Usman Khawaja has been beaten outside off stump. Once again, Australia struggling to get going inside the Powerplay. Short ball and pulled away by Carey for his and Australia’s first boundary of the innings. Some way to get off the mark. Meanwhile, Aaron Finch is almost run out at the other end as Ravindra Jadeja fires in a throw from point. Finch was not even in the frame had Jadeja found his mark with that throw. Close. Australia 5-0 after 2 overs. Wouldn’t Australia love something similar from Finch today? End of Over 1: It was a long over to be honest, but Bhuvneshwar Kumar starts off the way only he does, neatly. Australia score just 1 run in that first over. And we’re back. The covers are off and the rain has stopped, for now. Bhuvneshwar Kumar resumes. Alright, so it’s not exactly pelting down at the moment but it does look a bit heavier than earlier. This is frustrating, really. It’s the third time rain has affected play this morning – before the toss, after the toss and now with just two balls bowled. Bummer! Just two balls into the match and we have been interrupted again due to rain. The players go off the field and the groundstaff come running in. It’s still only a drizzle and hopefully it stays that way. It’s still overcast but the covers are off and the players have made their way to the ground. As usual, Carey and Finch are out opening the innings and Bhuvneshwar Kumar has the new ball. He has dismissed the Australian captain twice. Will he make it happen again and provide India another early breakthrough? Arghhh! Like Virat Kohli said it. It’s going to be one of those start-stop days. It’s started drizzling again and the covers are on at the MCG. We will have a delayed start. Virat Kohli, India captain: We’re having a bowl first. It’s quite overcast. It’s going to be stop-start, with the rain around, and as a batsman we are never in, so that’s the idea. We’ve had a good tour and we want to finish on a high. Levelling the series was important, now both the teams are set up for the decider. All the boys are motivated for the game. 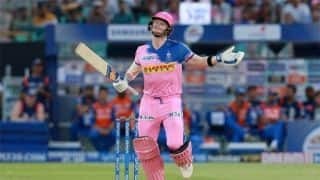 I had to get into a zone in Adelaide because the situation demanded it, Rohit, DK and MS batted beautifully as well so it was a total team effort. 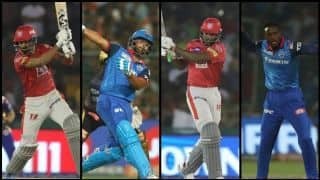 Siraj makes way for Vijay Shankar, Chahal for Kuldeep, Jadhav for Rayudu. Aaron Finch, Australia captain: I would’ve bowled first too. There might be a touch of moisture but it’s still a good surface. It might be slow to start with, but it won’t change too much during the course of the game. I think It’s been an exciting couple of weeks, a great win in Sydney and a really good game in Adelaide. We’re ready to go for the series decider. I do hope to just get back to my natural game to be honest. Changes: Stanlake in for Behrendorff and Zampa in for Lyon. TOSS: India captain Virat Kohli opts to bowl at the MCG in overcast conditions. Three changes for India. Shankar replaces the expensive Siraj and Kedar Jadhav comes in place of Ambati Rayudu. In a like-for-like replacement, Yuzvendra Chahal will take Kuldeep Yadav’s place. What do you make of these changes? Good news. folks. We should have the toss in the next 5-10 minutes. And if no further rain, the match will start on its scheduled time. TOSS has been delayed at the MCG. Again, for the same reason. 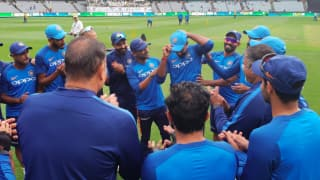 Meanwhile, Vijay Shankar has received his ODI cap so India are assured of one change for this decider. Who misses out? Will it be Jadeja? Or does Shankar come in in place of the third pacer Mohammed Siraj? We’ll have the answer soon. UPDATE: Toss has been delayed. However there is nothing to worry about. It seems to be just a precautionary measure from the umpires. It’s overcast at the MCG right now but the forecast for the rest of the day looks good. Hello and welcome to our LIVE coverage from the 3rd ODI between India and Australia from the Melbourne Cricket Ground.